A vast view is spectacular – but paradoxically, framing that view, making it smaller, can emphasise just how magnificent it is. That certainly is the case with this new home, perched on the side of one of Brisbane’s western mountains. The eye skims across valleys, to the low hills beyond them and further out to Moreton Bay, and there is almost too much to appreciate. But approaching the carefully placed entrance deck, the view is framed like a picture, and the detail emerges. The upper level of the house floats at ground level – the lower level is built into the slope and allows the architectural detail of the roof to shine. Designed by ETS Architects, and built by Scattini Construction the house perches on the hill like a bird at rest, wings lowered to protect the long low lines and anchor it in place. Divided into pavilions by the entrance deck which also links the upper and lower levels, the main area comprises kitchen and living spaces – a terrace fronts both and provides an outdoor area to breathe in and appreciate the fresh clean air, and the call of the whip birds and bell birds who are the closest neighbours and who provide a soundtrack to the view. 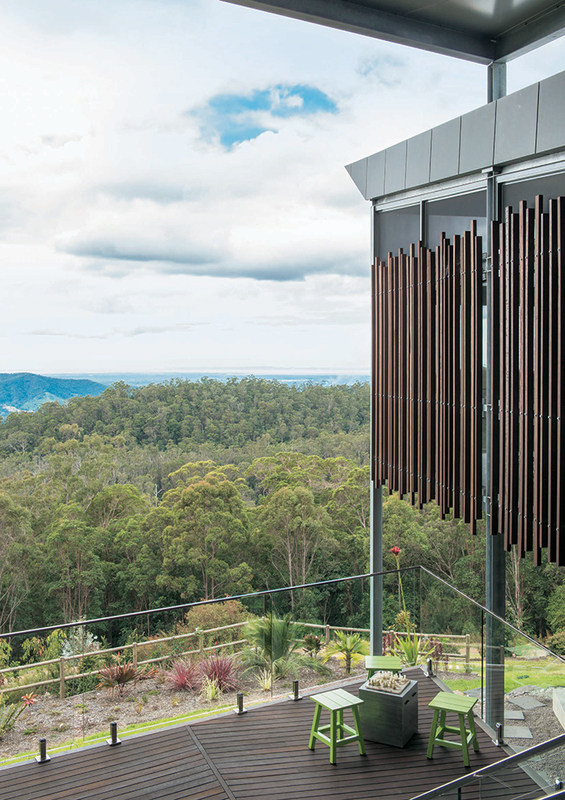 Glass balustrading allows an uninterrupted appreciation of all the subtleties of light and shadow which pass across the valley and hills beyond while bifold doors protect the terrace when nature gets rambunctious and the winds blow from the coast. 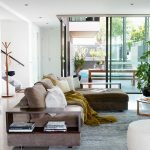 The interiors are understated, with polished concrete floors to provide a neutral backdrop to the living spaces while a two sided fireplace brings warmth and comfort, as does underfloor heating when the weather is cold. The kitchen takes pride of place as the focus of the living areas. Designed by Kim Duffin of Sublime Architectural, it is a masterpiece of intelligent and creative use of space, and cutting edge materials and technology. 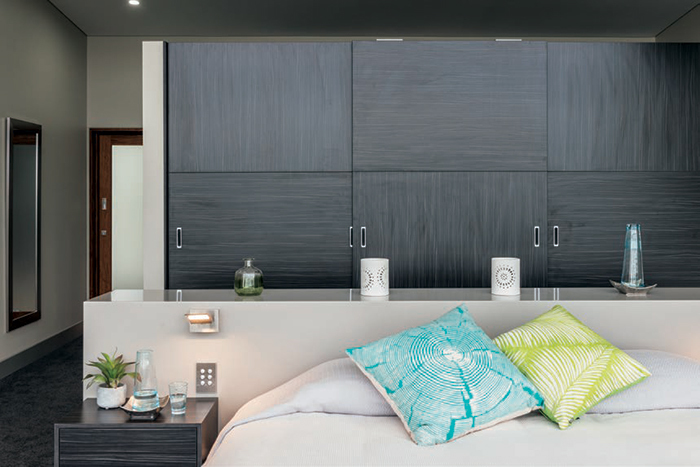 “The clients wanted an achromatic look for the interiors” says Kim, “so we opted for white and grey – white Starion bench tops teamed with grey for the wall of cabinetry around the double door fridge. The one concession I managed to wring from the owner was to line the bulkheads which accommodate the lighting in Rosewood – I thought it needed a little warmth, and it has proved to be a success, luckily!” The rosewood works with the sliding doors throughout the home which are also framed with it, and which come from Duce Joinery. Porcelain stack tiles continue the theme as the splashback to the benches, and Linen Finish stainless steel benchtops provide a practical and hard wearing surface for food preparation. Kim has placed task lighting above the benches and stove areas, and decorative lighting above the fridge and bank of storage cupboards which feature lift up doors for easy access. The benchtop which houses the sink hides a concealed cupboard which, at the touch of a button, rises up to reveal on the outside storage for wine glasses, and on the inside a handy space for storing small appliances. It’s a savvy feature that doubles to hide any mess in the kitchen! A walk-in butler’s pantry provides additional storage for food and larger appliances. But the star of this kitchen has to be the stainless steel wire embedded in resin which wraps the bench. Called ‘Acrylic Couture’ Kim ordered it from overseas – “It took ages to get it here, but it was worth it” he says. “When it is illuminated it provides a shimmering sculptural dimension to the kitchen which is truly beautiful.” A picture window on the back wall of the kitchen means that where ever you choose to sit at the bench, you still get the advantage of that gorgeous view. While the living/dining/kitchen area take up most of the upper level, it also accommodates his and hers studies for the owners and a laundry with a view. Crossing the entrance deck takes you to the master suite of bedroom, bathroom and walk in robe – floor to ceiling glass wraps around the bedroom and electronically controlled blinds shut out the light and view when it is time to sleep. The bathroom is also Kim’s work, and luckily for the owners’ modesty, there are no neighbours as floor to ceiling glass features here as well. Downstairs is home to bedrooms, bathrooms and a sitting room for the adult children, self contained and with a deck area for each with a daybed for lazing away the days when they are home. And while the views have been incorporated into the design and decor of the home, taking centre stage and providing an ever changing panorama of sky and clouds, hills and valleys, the house itself is thoroughly suited to, and settled into, the site. Clad in zinc, it complements its glorious location and provides a haven for its busy owners to return to – to breathe in, listen to the birds and enjoy their beautiful home.